From all reports, the firearms community is going through a reloading “revolution.” By that, I mean that more and more folks are reloading their own ammunition. I thought I would present a brief analysis of the economics behind reloading, because the Jewish Marksman celebrates frugality. Fixed costs: In order to reload ammunition, the shooter needs to invest in equipment to get the job done. A bare bones setup consists of a press, caliber-specific dies, and a powder scale. With a little ebay persistence you can spend anywhere from $100 to $1500, depending on the bells and whistles. A press and dies will last several lifetimes if care for. Possibly a table and other hand tools might need to be purchased, but any sturdy workbench will do. Variable costs: A round of ammunition has 4 components: bullet, shell casing (a.k.a. “brass”), primer, and powder. For our purposes I’ll take a quick look at .223 rifle reloading for my High Power competitions. The most expensive component are the match-grade bullets, so first I’ll discuss some of the options and issues. The main issue is that the heavier the bullet, the less susceptible it is to being blown by the wind. The wind is a big factor in the 600 yard stage of a High Power match, but not a big factor at the 100 yard reduced courses that make up most of the matches in my area to shoot. Heavier bullets cost more. The second major issue is quality and uniformity. I’m told this makes a difference, but I have not tested it myself. The idea is you buy from a quality bullet maker and you are assured your bullets will be closely uniform in weight, shape, etc. The overwhelming consensus among High Power competitors is that a 77 grain weight bullet is the right bullet for 600 yards. 77 grain bullets cost roughly $100 for 500. That works out to $0.20 a bullet. For 100 yard courses, many use a lighter 52 or 53 grain bullet, which cost about $80 for 500, or $0.16 a bullet. A cheap 55gr bullet can be found for about $0.08 to $0.10 in bulk, so I find this idea attractive but need to do some research if other shooters have had success with cheaper bullets at 100 yards. The only brand of rifle bullets I use currently are Sierra. Powder is cheap, an 8lb. tub will cost $130 or so, yield about 2400 charges for roughly $0.05 a round. Primers run $20 per 1000, or about $0.02 a round. Brass cost is a little tricky to analyze, because brass can be reused many times before it cracks or otherwise becomes unusable. If you pay $200 for 1000 pieces of new brass, it probably costs about $0.01 or less each time you fire a given piece. Also, cheaper once-fired brass can be bought in bulk, or your buddies who do not reload might just give it to you. Summed up, we come up with a per-round cost of $0.25-$0.30 a round using match grade bullets (click here for a handy on-line calculator). (I did not account for shipping costs, but assume the buyer is buying in bulk, as most do, so the shipping costs become negligible per round). A High Power match is an 88 shot event with sighters, so it costs me roughly $25 in ammo to shoot a match. You can see my interest in determining whether I can get just as good results from a cheaper bullet at 100 yards, because if I get my bullet cost down $0.10, I save $8 a match. What does factory manufactured .223 ammo cost? A lot depends on quality and application. Match grade ammunition is around $0.80 to $1.00 a round. Cheap bulk steel cased ammunition is about $0.20 a round, but steel cases cannot be reloaded (from what I hear), and bulk ammo is usually only 55gr. bullets which will not perform as well in the wind at a 600 yard match. The cheapest brass-cased bulk ammo, again usually 55gr., goes for around $0.32 a round. So for a High Power competitor, the savings are $50-$60 a match by reloading ammunition when the heavier bullets are needed. For a 100 yard match, given the options I am still probably saving by reloading. It is hard to say because I don’t know whether the cheapest bullets are an option for me or not. For shooters who are only shooting at 25 and 50 yards and where 1 MOA is not necessary, then certainly they will save money with cheap bullets by reloading, even compared to manufactured steel cased ammo, I would think. For pistol reloading, the same principles apply except the brass can be used many more times, and bullets are cheaper. For example, an un-jacketed 200gr. .45ACP bullet I use in Bullseye competition is only about $0.07. I have not looked at pistol ammo prices in a long time, but I have no doubt one saves a ton of money by reloading pistol ammo as well. Of course, there are the immeasurables. Time for one, as ammo does not reload itself. It takes most folks about an hour or two to crank out 100 rifle rounds, maybe half that for pistol. When you are buying equipment, some of the premium you pay for is time-saving. On the plus side is the fact that you end up producing ammo that is better than what just about any factory is producing these days, and you can fine tune certain variables to your firearm for maximum accuracy. This entry was posted in Uncategorized on January 30, 2011 by jMark74. 18 is considered a lucky number in Judaism. The word for “life” in Hebrew is “chai.” The Hebrew letters for “chai” are also numbers which add up to 18. So given that, how could I resist a chance to shoot a real across-the-course (XTC) NRA High Power match this weekend? You see, the prone portion of the match is at 600 yards, which is 1800 feet! I shot fairly well, all things considered. Besides being my first real XTC match (I normally shoot 100 yard reduced target matches), it was the first time I used my own hand loaded rifle ammunition, and I had no idea exactly how to zero my sights for the different yardages of the match (600, 300, 200) for that ammo, and you only get 2 sighting shots per stage. Take a look at the picture above, which are the 20 shots I made in the 300 yard prone rapid-fire stage (10 shots in 1 minute with a magazine change). 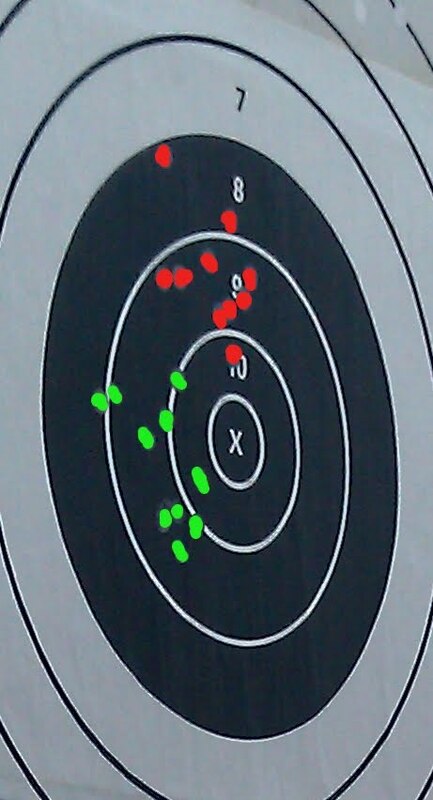 The first 10 shots are marked in red, using the sight “come ups” recommended by a friend. They were centered but just a tad high and left, in what could have been a 97 scoring group if the shots had been centered. I guesstimated the elevation sight adjustment, then made the green group, which is the correct height but still off to the left, probably due to cant in my seated position which I haven’t dialed in yet. Overall, I shot an 89%, which was pulled down from 90+ primarily to an abysmal offhand performance due to strong wind gusts. No, the wind wasn’t really affecting my 77grain sierra bullets so much as it was blowing my barrel around and making it very hard to confidently get a shot off. I waited for breaks in the wind to hit my 10s and 9s, but impatience and a lack of experience in the wind got the best of me, and I let a few really bad shots off. All the other competitors’ scores suffered offhand for the same reason, so I don’t feel too bad about it. I’m confident that next match I will shoot above 90% now that I have a much better idea of where my zeros are for the ammo I load. Every combination of powder, bullet, primer and barrel will have minor differences in velocity, which affects the bullet’s travel time over distance, which gives gravity more or less time to pull the bullet down. So the only way to get consistently centered is through trial and error. Without a wicked wind I might even flirt with another master score…I do have an industrial fan in the garage, maybe I’ll have it blow on me while I train with the Scatt this month! In case anyone is wondering, I shoot in the Service Rifle division with an AR-15…everything must be (more or less) just like a standard issue military rifle. We do get to put in match barrels and triggers (4.5 lbs. but 2-stage is allowed), but everything else is standard-issue such as plain old rear aperture and front post battle sights. This entry was posted in Uncategorized on January 10, 2011 by jMark74. Sad news for the (Jewish) firearms community. As covered by Debbie Schlussel on her blog, the founder of the pro-second amendment organization Jews for the Preservation of Firearms Ownership passed away. 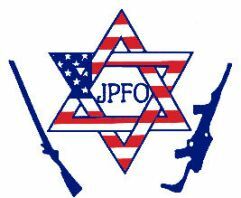 As my readers have come to learn, this blog focuses primarily on Jews in the shooting sports, and part of the reason for that is organizations like JPFO have/had the political bases covered. Note, I am unfamiliar with JPFO and cannot vouch for it, but if Debbie Schlussel endorses it, then very likely it is legit. Please visit her blog (click here), which will tell you more about Zelman and his organization. The JPFO is a good source of information on the theory behind private firearms ownership. For those of us who enjoy the shooting sports, it is sometimes easy to forget about the folks in second-amendment trenches who fight for the rights that are fundamental to our ability to compete in the first place. Here’s hoping that someone will pick up the torch and continue to be a loud Jewish voice in favor the right to bear arms. For now, this blog will remain as is, but we’ll see what develops! This entry was posted in Aaron Zelman on January 4, 2011 by jMark74.